The Skywalker Trampolines accessory game kit is the convenient and fun accessory kit for your trampoline. 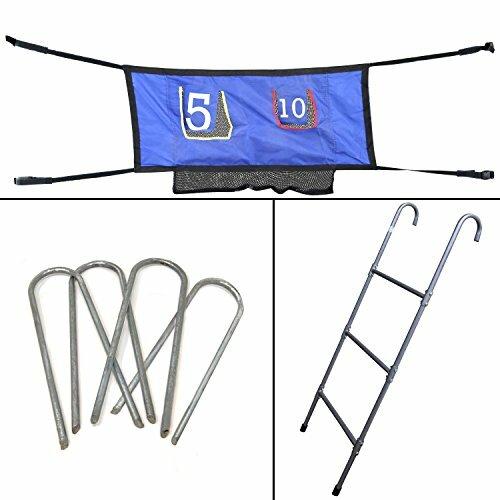 This kit includes a ladder, wind stakes and enclosure attachment bean bag toss game. All three items are compatible with many different brands and sizes of trampolines. The set of 4 wind stakes when used correctly with rope tie downs can help reduce the risk of damage to your trampoline. The trampoline ladder is easy to assemble with arched frame bars to hook onto the side of your trampoline frame. The Double Toss game easily attaches to nearly any trampoline enclosure providing a fun activity for children waiting their turn to jump.